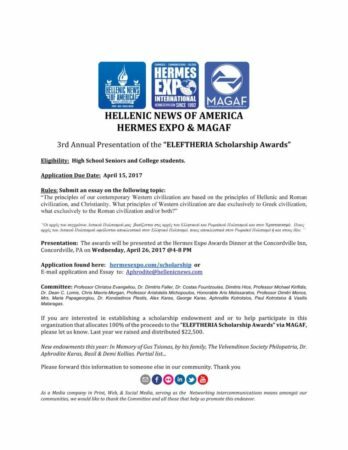 The organizers of the 2017 Hermes Expo Trade Show April 24-27 are offering business owners a little advice: Attend and Succeed! The 26th Anniversary Expo places the focus on quality events that encourage business owners to explore, discover, and participate, helping businesses connect with businesses. The Hermes Expo has been in existence since 1992. 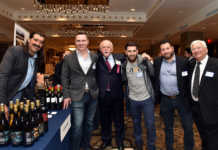 It brings together thousands of Greek-American and American-owned businesses, giving them a platform to showcase products and services in front of potential customers in the United States and Europe. It provides networking opportunities, connecting people and businesses from North America, Southeastern Europe and the Eastern Mediterranean. The Expo hosts exhibits, panel discussions, B2B meetings and educational seminars to help businesses grow. 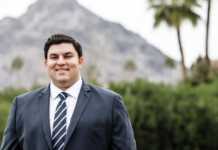 “For the past quarter century, the Expo’s purpose and reason for being has been to connect people and businesses. That is why we take care to create an atmosphere and environment that makes it easy to network, explore partnerships and discover new opportunities,” says Hermes Expo founder and President Paul Kotrotsios. 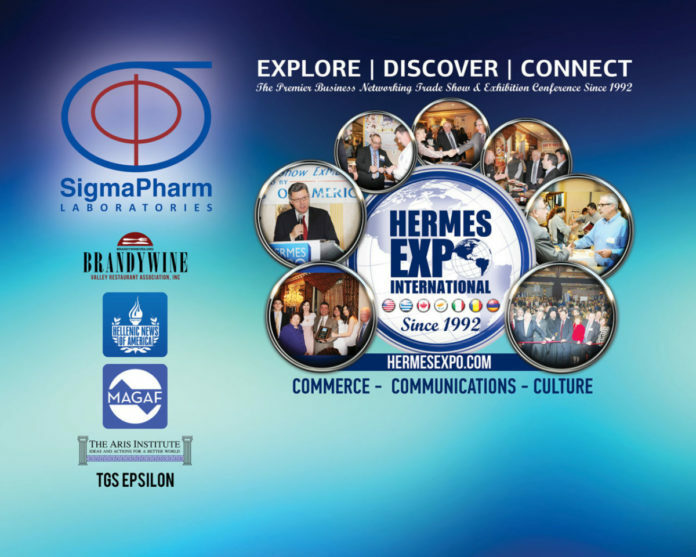 The Hermes Expo is where bargaining, marketing, selling, and buying takes place. It offers the spotlight to brands and companies ranging from the industries of banking, travel, hospitality, food services, art and culture, law, medicine, and government. Hermes Expo’s ability to promote international business and cultural exchange has resulted in solid business relationships. For example, the Expo has played a pivotal role in connecting the two governments and markets pertaining to Greece and America. This year’s Expo introduces the Hermes Trade Route, expanding business opportunities into the Eurasian markets. The Trade Route makes it easy for business owners to network, explore partnerships and discover new opportunities via Round Table and B2B meetings. The business trade show and exhibition conference takes place on two separate days in two locations; Manhattan, New York and Concordville, Pa. 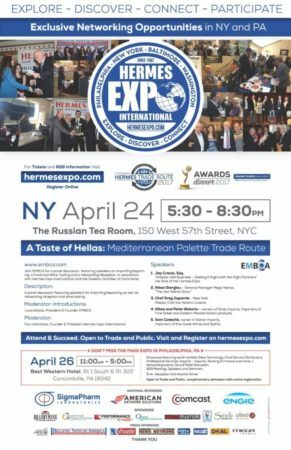 It begins Monday, April 24, 5:30 to 8:30 p.m., with “A Taste of Hellas: Importing and Exporting in the Eastern Mediterranean” at the Russian Tea Room, 150 W. 57th Street in New York. New York. Join the Eastern Mediterranean Business Cultural Alliance (EMBCA), in affiliation with the Hermes Expo International and the Queens Chamber of Commerce as it presents a panel discussion, wine and food tastings and speakers from the import/export business. “A Taste of Hellas” is designed to show the duel benefits of importing products from Greece, both to help the Hellenic Republic and businesses in America. “The event basically will showcase various Hellenic and Mediterranean products for sampling,” says EMBCA president Louis Katsos. Open to the public, business owners and trade representatives alike, “A Taste of Hellas,” in the landmark interior of the Russian Tea Room, offers samples of wine, cheeses, olives, and other products. Speakers ranging from a master chef of Hellenic Mediterranean cuisine to Hellenic product import experts will be featured. “A Taste of Hellas” also allows opportunities to network with other traders and business owners. On Wednesday, April 26, the Expo experience continues 11 a.m. to 5 p.m. at the Best Western Hotel, PA Rt. 1 South and Rt. 322 in Concordville, Pa. Trade individuals and the public are invited to check out the booth exhibits, showing off new technology, professional services, information on import-exports, banking and financial services, and more. Opening remarks will be delivered by Aris Melissaratos, Dean of the Brown School of Business and Leadership. The Hermes Expo Food Show, 11 a.m. to 5 p.m., plays host to the Brandywine Valley Restaurant Association and features booths from food service distributors showcasing special products, new technologies, discounts and other incentives for end users and owners of independent restaurants, diners and pizza shops. Eastern Business Software, Inc. will offer attendees and exhibitors a free review of their sales and marketing business processes, giving technology advice that could save them thousands of dollars. Visual Marketing Resources, LLC in Holmes will join the Expo for its fifth year, offering attendees, sponsors and exhibitors Eureka! (From the Greek, “I have found,”) a free one-on-one business consultation providing innovative cost-cutting solutions to lower costs and improve efficiencies. This year, the Mid-Atlantic-Eurasia Business Council will join the Expo, partnering, organizing programs, and facilitating Eurasian/Russian participation on April 26. For the third year, the Expo in Concordville will offer the Theodore G. Spyropoulos Seminar series, 11 a.m. to 12:45 p.m. The seminar is named after the late Ted Spyropoulos, a proud Greek-American philanthropist who believed that by working together we could move mountains. In 2017, experts will examine how the circumstances in Greece and Europe affect business here at home and abroad. Topics include trade relations in a global economy and the role of the Hermes Expo, urban farming initiatives and healthy eating, the Greek economic crisis and its impact on tourism and trade on both sides of the Atlantic, reducing food costs and increasing revenues with technology, and using the five senses to attract and develop your customer base. Invited guests and speakers at the Expo include Congressman Patrick Meehan (R-7), Delaware County Council Chairman Mario Civera, Gloucester County Chamber of Commerce President Les Vail; Mid-Atlantic Eurasian Business Council president and Hermes Expo coalition member Val Kogan; and Carol Brooks, manager, International Trade Office of Philadelphia Department of Commerce. From noon to 5 p.m., guests will have the opportunity to visit exhibits, network and attend B2B meetings. A 4:30 p.m. cocktail reception takes place in the exhibit area, followed by a 6 p.m. awards dinner in the Conference Center’s Grand Ballroom. The dinner honors individuals and companies for their outstanding works and contributions to society. Entertainment following the dinner and awards presentations will be provided by Stavros Theodorou & Orchestra. Among the honorees this year are Dr. Peter Stavrianidis, Harry Papadakes of St. Sophia Greek Orthodox Church of Valley Forge, Dr. Antonis Pratsos of Main Line Health, and Delaware County Vice Chairman Colleen Morrone. 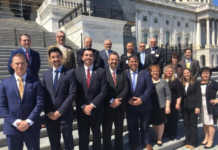 A special recognition will be given to the Hellenic American National Council (HANC) and American Hellenic Educational Progressive Association (AHEPA) honorees. He believes he was chosen for his success, not just in business, but for his work on behalf of the Hellenic American community these past 35 years. Dr. Stavrianidis is principle of the fourth generation family business “Venus Jewelers & Gemologists, Inc. in Somerset, N.J. He has also played leadership roles in organizations focusing on Hellenic issues of the Diaspora and the Genocide of Asia Minor. A political activist and lobbyist for Hellenic and Pontian issues, he was honored May 2007 by the Greek American Lobby in Washington, D.C.
Honoree Harry Papadakes is proud to be among such a distinguished group. Papadakes was one of the founding members of St. Sophia Church and the first president of the church Parish Council. He has been intimately involved in the church’s growth over the years, including in the purchase of land for the church. He helps organize its annual Greek Festival. 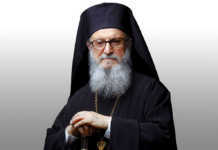 He and the other founders also set the church on its path to build a new Byzantine church at its current location. A committee of 14 leading academicians, publishers, physicians and other professionals reviewed and selected the winning essays. Last year, $22,500 in scholarship funds was awarded. This year’s total is expected to be over $30,000, with 100 percent of donated funds going toward the scholarships. 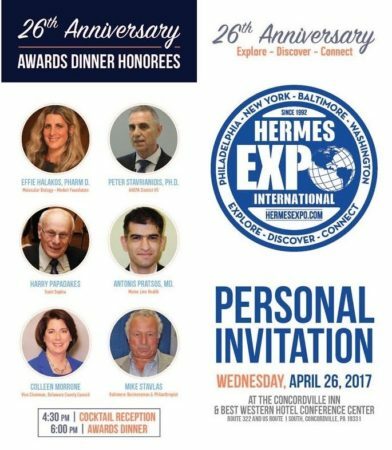 For more information about the 2017 Hermes Expo, or to register for any events and the awards dinner, visit www.hermesexpo.com. Register on line for free admission. You can also call 610-446-1463 or email [email protected] for information about sponsorships and participation in the booth exhibits or seminars. Reservations for the awards dinner are also available by calling 610-202-1972 or 484-843-4984. Tickets are $125 per person or $1,250 for a table of 10, or $150 at the door.